For commuters, taking a cab is far more convenient compared to riding jeepneys and buses. Drivers don’t have to make frequent stops to pick up more passengers, and they can use shortcuts unlike jeepneys and buses who have a set route. Despite this convenience, instances of theft, malicious intent, and just plain discourtesy still happens. It’s become habit for Filipino taxi passengers to send via SMS the plate number of the taxi they boarded to a friend or family member in case something unfortunate happens. 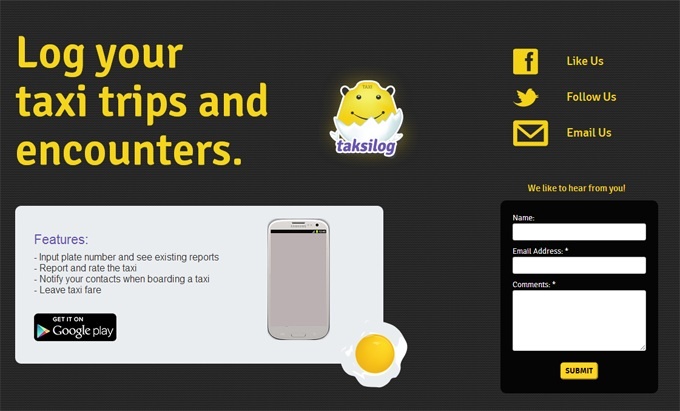 Enter Taksilog, a mobile app that lets users log their taxi riding experience. This new taxi-centric app is not about hailing cabs. Instead, it lets users inform their family and friends about their taxi experience. How? Basically, after the user has signed up, the first thing they need to do is to add their personal contacts that they want notified if they ride in a cab. When a user is about to ride a cab or has just exited on, he or she can enter the plate number of the vehicle. This will then push the app to notify the users via SMS or email. Even though the app’s functionality simply centralizes a habit that many Filipinos already practice, it sets the stage for more sophisticated features in the future. Moving forward, the Taksilog team hopes to add driver reviews, integration with the regulatory board and a panic button. 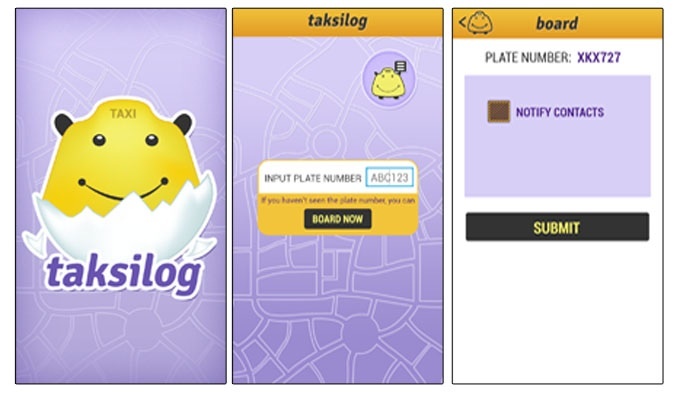 Taksilog is available for download on Android. It will also soon be available on iOS by the end of the year.